In 8-inch skillet, combine 8 oz shredded deli rotisserie chicken, 1 package (1 oz) Old El Paso™ taco seasoning mix and 1/4 cup water. Cook and stir over medium-low heat until chicken is coated with seasoning and mixture is hot. Add 1/2 cup shredded Cheddar cheese; stir to combine. Set aside to cool slightly. In small bowl, toss 8 oz taco-seasoned, fully cooked ground beef and remaining 1/2 cup shredded Cheddar cheese. 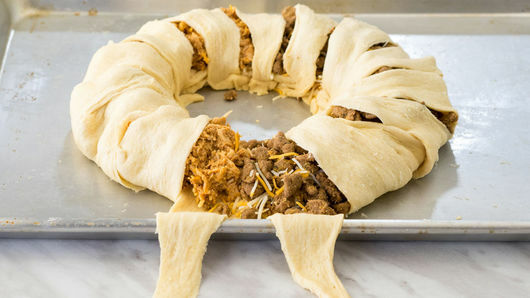 Spoon beef mixture on half of the crescents, towards center of ring, leaving other half empty. Spoon chicken mixture onto other half of ring. Bring point of each dough triangle hanging over side of pan up and over filling; tuck dough under bottom layer of dough to secure. Repeat around ring until entire filling is enclosed. (Some filling might show a little.) Carefully separate dough perforations on top of ring until some filling peeks through. 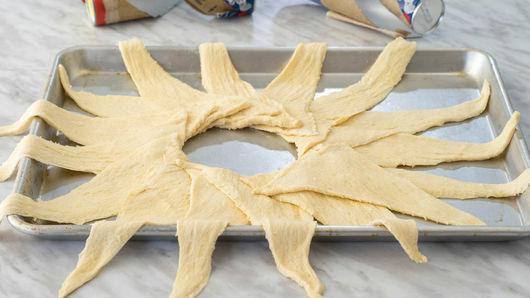 Bake 20 to 25 minutes or until dough is golden brown and thoroughly baked. Cool 5 to 10 minutes before cutting into serving slices. 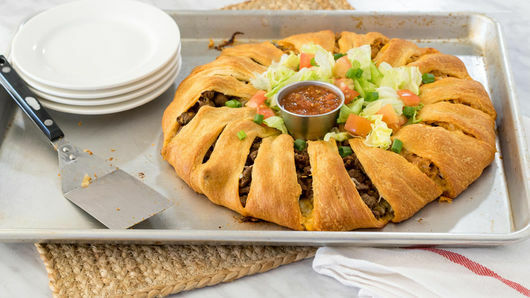 Serve slices topped with shredded lettuce, diced tomato, sliced green onions and Old El Paso™ thick ‘n chunky salsa. 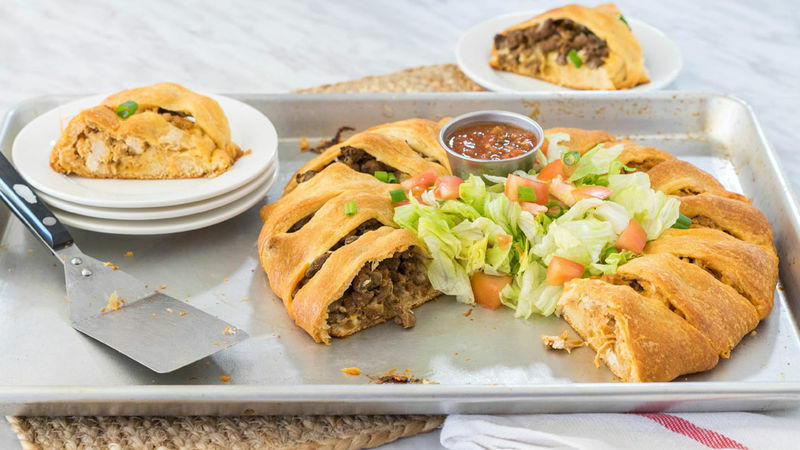 Try spicing it up by substituting pepper Jack cheese for the Cheddar cheese and adding diced jalapeños to the beef mixture. 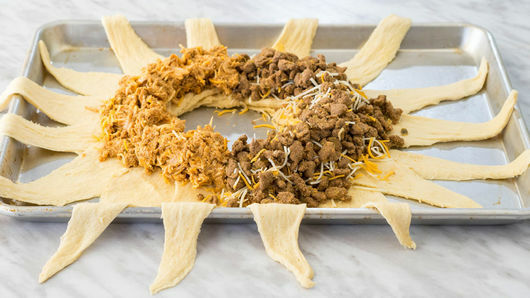 To make it cheesier, remove the taco ring from the oven after 18 minutes and sprinkle an additional 1/2 cup shredded Cheddar cheese on top of the ring. Return to the oven and finish baking.